An evening of music and celebration to raise funds for Chicago Jazz Philharmonic’s performance and education programs. 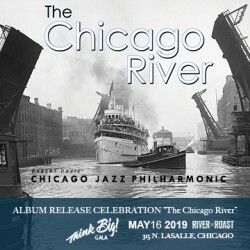 Guests will be treated to an exclusive “director’s cut” style listening (and viewing) session of excerpts from our newly released album “The Chicago River”, an Orbert Davis orchestral composition inspired by photographs from The Lost Panoramas: When Chicago Changed its River and the Land Beyond, which documents the historic reversal of the city's waterway. 150+ Donors and friends, Gala Host Committee members, corporate executives, members of Chicago’s philanthropic and arts community. ABOUT CHICAGO JAZZ PHILHARMONIC Founded in 2004 by Orbert Davis and Mark Ingram as America’s definitive “Third Stream” orchestra, Chicago Jazz Philharmonic provides rich, accessible, multi-cultural music experiences that bridge gaps in jazz and classical genres. The CJP performs works from the standard jazz big band to the classical symphony, while creating a “new aesthetic” in cross-genre collaborations. The organization also provides music education through Jazz Alive, a weekly music and band education program for Chicago Public School students, and the Summer Jazz Academy, a two-week immersion program in music theory and practice. Chicago Jazz Philharmonic performances entertain and inspire, and the community-based education programs improve lives from school age through adulthood.